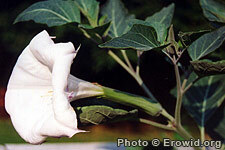 Datura is a woody-stalked, leafy herb growing up to 2 meters. It produces spiney seed pods and large white or purple trumpet-shaped flowers that face upward. Most parts of the plant contain atropine, scopolamine, and hyoscyamine. It has a long history of use both in S. America and Europe and is known for causing delirious states and poisonings in uninformed users. Are datura safe to grow around cats? What are "Hell's Bells" flowers?